This is a simple builtin calculator for instant calculations. The Calculator supports the common math expressions of Plot. 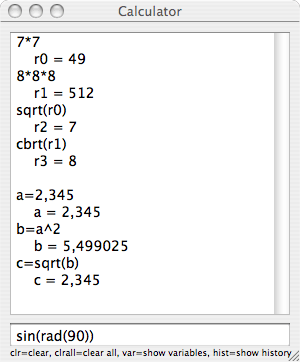 Just enter your calculation in the lower text field and hit return to get the result in the upper textfield. The result of every calculation is stored in a variable (r0 ... r<n>). These variables can be used in later calculation and also in all other functions where Plot allow expressions (e.g. in the function generator). User variables can also be used in all other functions where Plot allow expressions.